RANCHO CORDOVA, CA (MPG) - The Rancho Cordova Chamber of Commerce, with sponsorship support from the City of Rancho Cordova, hosted the inaugural Barrel District Experience on October 6, 2018. The fundraising event gave ticketholders access to private parties at the nine businesses in Rancho Cordova’s Barrel District: Gold River Distillery, J.J. PFister Distilling Company, Thin Line Brewing Company, ol’ Republic Brewery, Old Hangtown Beer Works, Fort Rock Brewing, Claimstake Brewing, Burning Barrel Brewing Company, and Strad Meadery. Sheryl Smith, owner of Smith Real Estate Services, Inc. (a local small business in Rancho Cordova) and Chamber of Commerce board member, originated the idea of the Barrel District Experience and chaired the event. The Chamber of Commerce partnered with eight local businesses that donated food for the Barrel District Experience: Pocket Deli, Go 4 Pizza, Mod Pizza, Petali, Chick-fil-A, KP International Market, Parkwest Casino Cordova, and Yarbrough’s Catering. Rancho Cordova locals Stephanie and Ken Miller visited J.J. PFister Distilling Company as their fourth stop in the Experience. 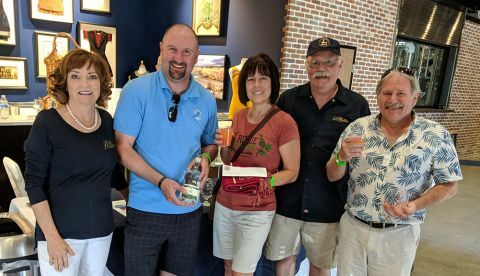 The Millers had never been to the distillery before the event and, Stephanie said “it has a great showroom, a great ambiance.” Stephanie was the winner of J.J. PFister’s Experience giveaway: two tickets to a Sac Republic game and a bottle of gin. Dan Slort quipped that he is the “owner and dishwasher” of Strad Meadery. He first started in a location on 16th Street in Sacramento, but when he wanted to expand they just wouldn’t work with him to find suitable space in a timely manner. He talked with City Halls in a few different surrounding areas, but he said Rancho Cordova went out of its way to make it as easy as possible for him to get the space he needed. “Rancho Cordova City Hall has been awesome,” he said. Each batch of mead is unique because it’s made from local Sacramento wildflower honey. “If you have allergies, drink two cups of mead every day for a year. And then after a year, you won’t have a job… I mean, allergies,” Slort joked. The inaugural Barrel District Experience was an extremely successful fundraiser for the Chamber of Commerce and highlighted many local Rancho Cordova businesses. Kate and Mark Reuter enjoyed the Experience so much that they’re already planning to purchase pre-sale tickets for next year’s event as soon as they go on sale.